I love the rooms at The Rhinecliff Hotel. There is something special about the lack of clutter, the “granny chic” touches, the way the walls jut and curve, and the rich, broad-beam wood under my feet. Of course you have to like funky, like it a lot, to love The Rhinecliff. It sits across an antique railroad trestle that looks like a set for a play. A real train passes under it on its frequent journey to Manhattan, and its whistle in the night is either a lovely lonely sound of travel, or it’s an annoyance. Wisely and humorously, management provides ear plugs, but most guests who stay at this 9-room hotel on the banks of the Hudson River appreciate the sound. And they appreciate the outdoor dining on the terrace over lookng the Hudson. 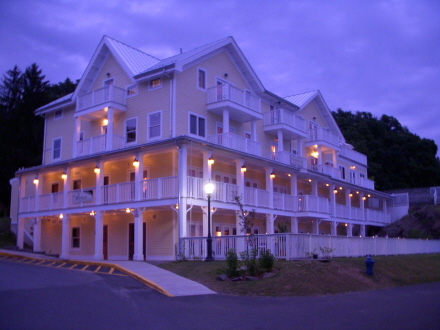 The Rhinecliff is a destination hotel. People come here for the fun, up-beat progressive events like Tango night. From the alfresco dining space it’s great fun to watch the dancers slide by open doors (now you see them, now you don’t), an elegant angle of an arm here; a head suddenly turning there. A full view of the dancers, briefly. Glasses raised in a silent toast. Then there’s Iron-Grad Night, a fun, loud, packed competition among several Culinary Institute of America grads (CIA) where the choices include Peppered Crusted Goat Crouton with Summer Squash Noodles, followed by Scallops and Chanterelle Mushrooms, etc. all paired with appropriate wines. We missed Bastille Day (July 14) with Elaine Rachlin singing “Vive La France,” and on it goes. The tiny hamlet of Rhinecliff is about 5 miles from the better know rather chic town of Rhinebeck, and within a short drive there’s Bard College with its spectacular new theater. There’s a very cool River Walk Bridge that spans the Hudson for pedestrians and of course the house that Frederick Vanderbilt built in nearby Hyde Park, a perfect example of a country home in America’s gilded age. The Rhinecliff Hotel continues to invent itself for its guests and itself, making it a hotel easy to love. So, how wrong can we be ? Next: Mission: Impossible? Not for JetBlue’s Agent Zero! awesome hotel. It has nice and beauty full environment inside the hotel.some hotels like hong kong hotel and etc are following the tradition of their countries.This hotel also follow that.